The girl eagerly marched towards Ugochukwu, who placed the painting on the seat he had just vacated to save himself further embarrassment. As he went to find his elder brother, Obiora, who had just stepped out to the compound before the incident, mother and daughter high-fived each other. They had been hoping and waiting for just such a moment and to say they were thrilled was putting it mildly. Chiwetalu did a few dance steps while Chidera gave a rhythmic clap in accompaniment. Chidera, whose teenage hormones had been dying for some excitement since she came for the holidays, did a high-pitched laugh. Then she stood at attention and gave her mum a mock military salute. They went towards the mango tree in the compound under which Chiwetalu’s husband, Obiora, liked to rest on hot afternoons such as this. There were a few plastic chairs around, two of which were occupied by Obiora and Ugochukwu. Chidera brought one for her mum, waited for her to sit and then stood behind her in much the same way as aides-de-camp do. Their arrival stopped Ugochukwu, who was just about to tell Obiora what Chiwetalu had done to him, in mid-sentence. Chiwetalu ignored him and addressed her husband. “Hallelujah!” he answered as folks do in church. Onyeka, was their only son and he was living in Europe. Obiora couldn’t hold his joy. “Yes oh! It’s happening, contrary to the thoughts and imaginations of some people,” Chiwetalu replied, glaring pointedly at Ugochukwu. Obiora missed the stare as he was beckoning on Adaeze, his older daughter to come. He was considering the drink he would ask her to bring but he decided to go and fetch it himself. He was oblivious of the undercurrent of meaning in his wife’s statement. Ugochukwu, unable to stand the discomfort, excused himself to make a call. His visit to the village had turned into a “total waste of time” as he described it to a friend on the line. His elder brother and his family lived in the three-room house he managed to build for his parents when he had a job (two bedrooms and a parlour with makeshift kitchen and conveniences outside the building). Since both parents were deceased, he moved there with his family when he lost his job as the Stores Manager of a private firm in Lagos. He opened a provision store in the village while his wife taught at a local school. Land was scarce in their community, so only Obiora had inherited a portion of land. Due to his misfortune, Ugochukwu had calculated he had no way of building a better house. And knowing Obiora to be very kind and always yielding to his demands as his younger brother, he had mentioned he would like to build a house in the village, believing Obiora would easily surrender his land to him. His intention had been to see the land during this trip and call a guy from Nnewi to survey it. Now, with the news Chiwetalu had relayed, that would no longer be possible. Ugochukwu, a group manager at an oil company, did not appreciate this kind of setback. He was shocked that Onyeka was doing well enough to send money for such a project. Onyeka, his brother’s only son, left Nigeria in frustration eight years back when Ugochukwu would not assist him sponsor his education in the university after his dad lost his job. At the time, he had two of his own kids in private schools abroad, had just started building his third house in Lagos and his family were due to go to Australia for their annual vacation. It was the third year that Onyeka had appealed to him and while he didn’t exactly say he wouldn’t help, he kept giving the young man the runaround till he ran out of patience. As God would have it, a British teacher in his former secondary school (Mr Barnaby), whom Onyeka often served was going home on retirement, and offered to take Onyeka along, although he could not promise the boy much. No one told Ugochukwu about this. About the same time, he came for a stint at his company’s London office. Onyeka asked his father to get the address of his residence in London. Ugochukwu unsuspectingly gave it thinking it was no use to his brother anyhow. When Onyeka showed up at his home in Chelsea, London, to seek assistance, Ugochukwu threw a fit and accused the boy of stalking him and his family. But favour eventually came Onyeka’s way through the family and friends of Mr Barnaby. He completed studies for a bachelor’s degree in accountancy and got a job. Although he was not swimming in money, he was prudent with what he got and sought to do something meaningful for his parents. It pained him that his dad trained his younger brother and doted on him, but his uncle specialised in taking, sparing no thought for his older brother or his family ever since he fell on hard times. Onyeka thanked God his parents had only three children with at least five years between each of them. His mother’s slowness in conceiving which gave her a lot of concern in the past had turned into a blessing in disguise. Still, the family had to adopt the strategy of halting one child’s education at some point to focus on another’s, with the exception of Chidera’s. In all their difficulties, Ugochukwu kept his distance. He never brought his family to spend even Christmas in the village. They spent all their vacations abroad. He never invited any member of his brother’s family to visit his own either. The few times Onyeka went to see him in Lagos, he was not allowed into his residence. He stayed with a friend and went through a tortuous process to see him at the office. As a result, his children didn’t know their uncle and cousins. On the occasions he came home, he had a favour he wanted from his brother and would zoom off the moment he acceded to his demand. Yet, Obiora didn’t seem to mind. He maintained that he was his younger brother and should be blessed by him, rather than the other way round. So whenever Ugochukwu came around, Obiora would have Chiwetalu pack garri, palm oil, fruits and vegetables into his boot and the fellow would leave without reciprocating their kindness save for the occasional bottle of expensive wine he brought for Obiora. He also had the penchant of expressing interest in any good thing he saw his brother had. On several occasions, he had collected new shirts Obiora bought, just like he used to do during his teenage years. The very next week, Ugochukwu came to attend the New Yam Festival. When he saw the tablet Obiora was using to take pictures during the event, he admired and collected it from him. Meanwhile, Adaeze, Obiora’s older daughter who was in the university had been crying for a laptop. Since the family couldn’t afford one, Chiwetalu had been meaning to tell Obiora to give Adaeze the tablet to help her with her research project. She vowed to stop Ugochukwu’s “menace” and was looking forward to his next visit. She had overheard him talking of building a house in the village. She realised that his recent attendance at community events and public philantropy (building a health centre for the community and a classroom block for their village primary school) were aimed at qualifying hinself for a traditional title. He also needed a house in the village to show he fully identified with the people. Chiwetalu knew that although he could easily afford a hectare of land, Ugochukwu would be loath to buy any but would rather collect Obiora’s land. So when auspiciously Onyeka called asking what he could do to bring smiles to their faces, Chiwetalu told him the greatest need of the family was a decent house. Ugochukwu arrived in his brand new Lincoln Continental, as usual without so much as a loaf of bread for the family. Chiwetalu served him lunch without complaining, hugging to her chest what she had in the offing for him. He had been in a hotel in Nnewi since he arrived the previous night, had probably spent a small fortune entertaining his friends but he did not decline the offer of food from Obiora. As he was washing down the special bitter leaf soup and fufu* with a malt drink, his eye caught a painting on the wall. It was a landscape done by Chidera who was studying Fine Arts in the university. Obiora was proud that Ugochukwu adjudged the painting good. He also acquiesced when he requested to take it for his living room in Abuja, where he had recently been posted. Chiwetalu pretended she didn’t hear that conversation until Ugochukwu actually took the painting down and followed up the unexpected rebuke with the shocker about their intended house. With that, mother and daughter marched back to the house, leaving a still dazed Ugochukwu to wait for his brother and the drink which they doubted he would have the appetite to consume. Evil Ugochukwu! I hope he does not do anything to spoil Onyeka's fortune! May he be put to shame. My dear, such things as narrated in the story should never happen. Unfortunately, they do. This is why everyone should know God personally and stop putting their hopes in man. Thanks for reading. You are super blessed! Not sure it's up to a thriller. Just a commentary on extended family dynamics. Thanks anyway and remain blessed. Ummmm, would love to know what makes you think it's amazing. Cheers! The story is related to what's happening nowadays. Most times, people don't care about others. All they care about is what they can get from you and what you can give them. What the uncle did is quite bad and i don't see how wicked a person can be to just collect from those who don't have and never show pity or give them something in return when you have. He did bring his brother expensive wine from time to time. Lol! With the tests and personal observation conducted, I hereby diagnose Ugochukwu as suffering from mental impoverishment, and chronic slow-wittedness. Collecting from someone you are wealthier than and not even 'thinking' to give back: Who even does that! Lol, Dr Chioma! You'll be surprised at how many Ugochukwus there are out there. My own diagnosis is that he is very poor. Obiora, in my opinion, is the true rich man of the family. Such a generous person in my book is richer than a person who won't assist his close relatives, irrespective of how much money or property the latter may have. Glad to have you here, Chioma! God's grace in all you do! this happens in most families. there is always a relative trying to gain from the others. but no matter what, everyone needs love. So we should always give irrespective. You mean irrespective of the receiver's bad attitude or irrespective of how hard up we may be? In both cases, you'd be right. It's the Christian thing to do. God bless you richly in Jesus' name. there are gods but One GOD, though man is made in GOD'S image but man is not God. this GOD does things according to His righteousness, such as having mercy upon who HE wants to have mercy. if HE is with us, no one will be against us. So Ugochukwu is nobody,he is not GOD. It's true we have the extended family here but we must individually strive to make something of our lives, whether anyone chooses to help us or not. As you rightly said, if God is for us, no one's refusal to assist us will stop us from getting to the heights He has destined for us. You are lifted, Victor, in Jesus' name. And I so much love this God! This is a clear definition of His word: just as heaven is higher than the earth, so His ways and plans are higher than that of the inhabitants of the earth. God has the best plan for us, all of which no one can terminate. Good one, mum. Yes, my dear! God can make a way where there seems to be no way. Even if we have no family or friends to help us, we can become whatever we aspire to be with God's help. He can use anyone He pleases to bless us because the earth and they that dwell on it belong to Him. Have a beautiful weekend, Patience! This short story signifies that for every thing in life, there is time and season, as in the case of Onyeka who sent money to his parents to start building a house in the village. That shows that God does not need multitude to bless. He can use an individual as He has done with Onyeka who is the only son of the family. One willing person, you mean. Bless you, Onyebuchi! indeed there is God, and he shows mercy to any he wishes to. Nobody can be God, including those, like Ugochukwu, who treat other people badly. I believe that this is a fictitious non-fictional story. There are many Ugochukwus in many families who never​ care about the well-being of others. My strong belief remains that man cannot inhibit the plans of God in our lives. Don't be confused, my dear! It is a fictional story. It can't be both fiction and nonfiction although one element of good fiction is that it reads like real life. Happy Sunday! Self love and indifference to other people's needs have produced people like Ugochukwus in many families. They don't put other's contributions into consideration. But thanks to God because our welfare and fortune can only be shaped by God. Bless you! God is so awesome that sometimes when he does his work in us it is very difficult to explain. this also reflect to other post that says God is the father of the orphans, he is filled with surprises ,he makes way when there seems to be no way. Wicked people like ugochukwu will be ashamed of themselves because "no one one is God"
onyeka is a typical example of someone who didn't let side storms define him and let God to make the choice for him. i am inspired that no matter the ills people say about me, it doesn't make me what they say because no one is God. hmmmmmmm! This is an example of what we see everyday, people in better positions will refuse to help others forgetting that there is a God out there, who sees all things. The story is a pointer to happenings in everyday society especially in the Igbo setting. It tries to point that No one is God because you cannot have the final say and the antagonist, Ugochukwu shows a typical Igbo man who uses his wealth to oppress mostly family, but onyeka the protagonist against all odds made it. the story conveys greed, spite and hatred for one's blood. that's the case of ugochukwu who oppresses his elder brother cause he is more fortunate than him. we should learn to love and assist one another if we are in the position to do so. I agree and there is a big reward in doing so. Wonderful story Aunt Ohaja! you are indeed a prolific writer. Your story teaches us to be humble because no one knows tomorrow. Just like the name implies, No one is GOD! Humble and generous. What we consider chicken change can even transform another person's life. Thank you and remain blessed! Just like the Bible when they say: the stone which the builders rejected has become the chief corner stone. So is the story of obiora and his family. We should never look down on people because we don't know what tomorrow holds. My dear, you are right! The poorest person today can become the richest tomorrow. No one knows tomorrow indeed! May our tomorrow be glorious in Jesus' name. The rejected stone has finally become the corner stone. am glad God remembered obiora's family. A short and reasonable story. Truly, no one knows tomorrow so we should treat every one with love. Being greedy and wicked doesn't pay at all, this is a lesson to every one especially families in this kind of situation. God really remembered Obiora. Despite the indirect maltreatment Ugochukwu gave to his brother and his family, Obiora didn't reciprocate wickedness to his brother but showed him love. Sometimes people display a great degree of selfishness and greed just like the character, Ugwochukwu. It can happen to anyone. Sometimes we might not realise that a particular behaviour we may have displayed at some point in our life was inconsiderate. We have all done something selfish and greedy in our lives, but when we don't know where to draw the line, then it becomes wickedness! This is a very interesting story! At first I wondered at Chiwetalu's behavior but after going through the story it was obvious that she had taken enough and swallowed just too much spit on Ugochukwu's behalf. The fact remains that both good and evil people will always get their reward and anyone who thinks he is smart may just find out that the opposite is the case (Ugochukwu). Good story! This story is a mirror reflecting the incessant unfair practicecs heaped upon the 'have nots' of the society. It also brings to ligt the inhumanity of man (brother to brother). Chinwetalu shouldnt be blamed for her actions as i would have exhibited a more degrading and shocking reaction if i were in her shoes.vfinally, it is paramount that we all acknowledge the fact that no man controls or determines what is to happen in someone else's life. Even though it may seem so to some extent, God always shows up! Nice work, Ma. God is the only one that can make a way where it seems there is no way and with him all things are possible. Hmm! This is exactly what is happening in the world today especially polygamous families but what some ok people fail to understand is when you are happy with other peoples futune that's when God can bless you because nobody knows the head that will wear the crown tomorrow. The bible said, without contradiction, the lesser is blessed by the greater. Onyeka was blessed through the man he served. Destiny can be delayed but can never be denied. I love this story. he is just like most uncles who will turn their back once you get admission, only to call u on the of convocation to ask if u are actually graduating. RIDE ON MA! The character of Ugochukwu in this story portrays the selfish nature of some affluent ones in our various communities, those who always think about themselves without considering the welfare of the less privileged ones around them. Instead, they would like to collect the little the poor have and enrich themselves the more, leaving the poor poorer. Ugochukwu fails to help the family of his brother due to his selfishness, even Onyeka his nephew, who seeks for his assistance during his university education, without knowing that something good could come from Nazareth. This story is teaching us that tomorrow is pregnant, no one knows what tomorrow holds. Poor man today could be rich man tomorrow, vice versa. Wow! This story is an interesting one. the story is typical of what is happening or going on in our present society. Obiora is actually the kind of man we are looking for in our society. Although he was not wealthy enough, he gives all he has in helping other people, especially his unconcerned brother, Ugochukwu. This was to his detriment but he was not bothered. However,Obiora was blessed for his goodwill and indeed'No one is God'. It's a deplorable fact, especially in this unfair world we live in, that brother is unwilling to help brother. It's sad but true. I for one cannot stand to see any of my siblings in pain or unhappy, not if i can help it. I wonder if it's the same blood that runs in Obiora's veins that also runs in Ugochukwu's, it kinda seems unlikely. I'm glad that Onyeka, notwithstanding Ugochukwu's wicked treatment of him, still came full circle. God has won and this family has won with him. May his name be praised forever! Really interesting story..the wife is right in her doings. Its not even as if ugochukwu is not well to do. That someone is down today, does not mean that the person will be down forever. so we should be mindful of the way we treat people in their difficult situations because we do not know what the future holds for that person, and indeed no one is God. What i strongly believe in this life is that what will be will be. Come rain, come shine, there is still GOD. We should always pray to God to remove any spirit of envy inside us so that we can love one another. This story is so inspiring. i believe that no condition is permanent, so we should be mindful of our attitude. Thanks a lot Ma, U re indeed a blessing to our generation. Our Lord is a wonderful God. When no one expected it, one can see how God lifted Onyeka up even when there was no means. This serves as a lesson to all. One should not boast with whatever he has because a poor man today can be a rich man tomorrow and one should always learn how to use his wealth to help others in need. Indeed no one is God, except our LORD who lives in Heaven. He shows us his blessings when no one is expecting them. God has a reason for everything he does. he created everthing and saw that it is good. he formed Obiora and Ugochukwu in the same womb to be brothers, we watch out for the next phase of the story to know what happens next. Sorry, dear. This is not a series. You are blessed! Wow. So inspiring. Truly no one is God. He shows mercy to who ever he wants. I believe that no condition is permanent, so we should be mindful of our attitudes. Nice one, ma. this world is unpredictable,no one knows tomorrow,if ugochukwu had known that things are going to change for bad to him and good for his brother,he would have been a better person,this happens in our society today people have become so selfish even to take the one that belongs to others.Obiora's kindness and love in this story is worth emulating,he believes two wrongs cannot make it right,this story is interesting. Just like the name of the short story implied, no one is God. It seems as if people have sold their conscience for worthless things. That is why our politicians with all d money they have still embezzle public funds for their private use. No is God depicts we all as humans are not complete in character. You mean we're deficient or flawed in character. Bless you! Obiora's love towards his younger brother has been mistaken as stupidity by the same younger brother. God sure knows how to fight for the just. Shame on the evil brother, Ugochukwu. NO ONE IS GOD: AFFLUENCE WITHOUT GENEROSITY STINKS In “NO One is God, Aunty Edith Ohaja highlighted the antics of a stingy Ugochukwu who exploited the open arm generosity of his elder brother Obiora and his family members. When the nauseating situation could no longer be tolerated, wife and mother Chiwetalu conspired with her daughter Chidera to put their feet down to say no to nuisance in which Aunty Edith captioned There is limit to forbearance bringing to fore the shout from Chiwetalu to selfish brother-inlaw Ugochukwu when he reached out to take the painting hung on the wall for his personal use. We are reminded that Ugochukwu refused to lend a helping hand to his elder Obiara especially to his cousin Onyeka when the young man needed him most. Fortune shone on Onyeka as a Retired British Teacher Barnaby who took him along to Britain where he finished his studies and a got a good paying job. The money Onyeka remitted back home enabled Obiora to erect building on the land Ugochukwu eyed in the village. That Chiwetalu and her daughter Chidera rejoiced over the humiliation they meted out to Ugochukwu for his stinginess as he reached for the painting hung on the wall leaves much to be desired for we are admonished as Christians not to pay evil for evil. Are you kidding me? They didn't do it in the marketplace. The woman told him to drop the painting because he was robbing them blind while being as they say "stinkingly rich". He got far less than he deserved if you ask me. Indeed no one is God this story is a warning to those who despise other people's progress and never appreciate those who helped them become what they are,thinking nothing good can come out of them. Selfish Ugochukwu just chose to forsake the family of Obiora, thinking that without him the family will not succeed. But God proved to him that he can still put smiles on Obiora's family by bringing Mr Barnaby as a helper to the family. So my advice so far is, don't use your position in the society to suppress the less privileged. Rising from Grass to Grace, Ugochukwu in his wildest dream could never have imagined that his brother and his son would make it in life. One thing I love about the lifestyle of Onyeka was that he was determined and his determination made him to achieve his goal in life. One principle I have learnt about life is what I call the (3Ds) which are determination, discipline and dedication. These were the tools used by Onyeka to achieve his goal and he pressed forward to achieve his purpose regardless of so many challenges he faced in life. Life is like a river, no one knows where it flows from and where it is flowing to; No one knows tomorrow...........No matter where you are, who you are...............just be good always. Truly! No one is God.... Ugochukwu got his pound of flesh... We should always remember that no one knows tomorrow. What you said about Ugochukwu, that would be Obiora, or rather Chiwetalu. But I'd say they did next to nothing to Ugochukwu. Ugochukwu is sure suffering from a problem called greed and if he doesn't cut it off now, before it gets late, it will surely affect him and not just him, but also those dear to him. Indeed madu aburo chukwu (No one is God) because if that was the case then people would really be suffering. Ugochukwu is a typical example of take and not give but he does give to outsiders just to gain cheap praises and titles. 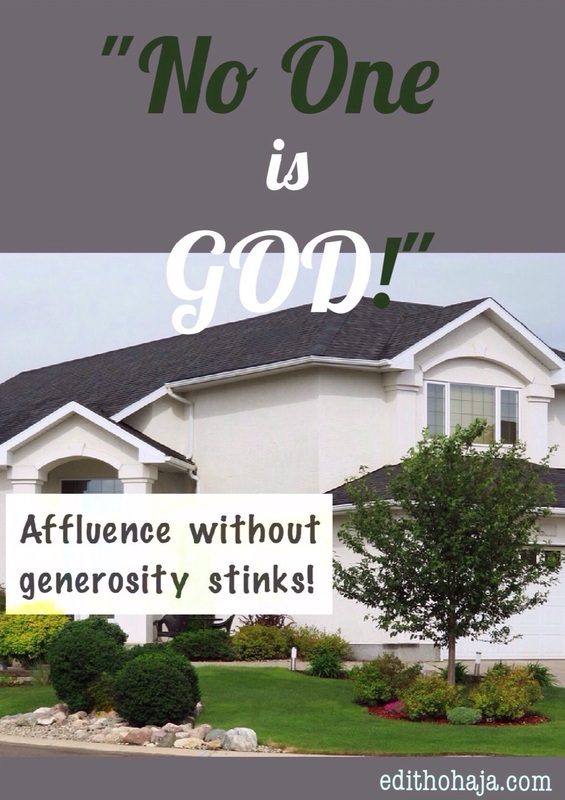 Like your quote says, Ma, "Affluence without generosity stinks". That is so true. And i also like how Chiwetalu stood up to Ugochukwu because tolerance should have a limit. Abi oh! Bless you, Victoria! ma, indeed the story is wonderful. See how that Ugochukwu wanted to plot against Onyeka, but then in the end God proved himself. Indeed a man should know God for himself. Being rich without being able to help those around you that are in need, simply means you are poor. You gain nothing for being selfish, greedy and jealous. Is good to be a good person despite what people are doing to you because God said we should love all men, do good to all men and good shall be yours. No condition is permanent in this world. It is not good to disdain anybody for whatever reason. Like the Igbos say, "onweghi onye ma isi ga abu eze". Mmadu aburo Chukwu! Thank God that man isn't God, else, who knows what this world would have turned to. Just negodu! After, amassing all the wealth that he could lay his hands on, he still derived joy in taking the little his brother had. Sometimes, people's acts show their lack of human sympathy and compassion. He should thank his stars that I'm not Chinwetalu, he would have received a full measure, shaken together and pressed down! Beautiful story, Aunty! Indeed! Forbearance ought to be limited in order to check the wicked. in real life, it does happen, when one decides to overlook the wrong doing of another, the later takes the former to be a fool, but if you show them that you are aware of their deceitful ways by fighting back, they will cease fooling you around just like Ugochukwu was shunned by Obiora’s wife. charity begins at home, those were exactly my mum's words growing up. I like the way the writer was able to use the title "no one is God".But Could it be that the writer tried to remind us her readers that no one is God/perfect before introducing her character Ugochukwu or that Ugochukwu was a bad character, that did not deserve to be justified with the saying that"no one is perfect"?. I personally think the writer used the character of Ugochukwu to address societal issues because I unapologetically think our generation has lost it all. To a lot of people charity now begins outside the home, we now care more about what the society has to say about us compared to how our family feels about us. The personal pronoun "i" has now eaten dip into our families making selfishness the order of the day. ugochukwu should not the blamed and Chinwetalu should not be applauded, instead, Obiora should be emulated because no one is God. Being fully aware that within each of us may be a flavor of Ugochukwu, Chinwetalu, obiora or a mixture of all. I think the writer wanted us to always remember that Family is forever and that whatever a man propagates that he reaps, maybe not today but at the right time. Always finding hope in these words of the writer "no one is God"
Yes oo No one is God or will be..beautiful story.. This story is quite interesting, indeed no one is God. With this story, I believe that people like Ugochukwu still exist but my only prayer is that God should not allow them to come close to me because I might not be like his brother Obiora..lol. I thank God for He will always know how to make a way for His children even where there seems to be no way for if men were God, this world would have been hell for the poor and the have not, I thank God for the family of Maazi Obiora for the ways of God is not like that of man and I must commend you aunty Edith for posting or sharing such an inspiring story with us, I pray that the sky will be ur starting point IJN. The attitude of udoka is really repugnant and disturbing, the behaviour rings a bell i my mind about what can be seen today. Pray tell, dear lady, who is Udoka? SERIOUSLY, NO ONE IS GOD AND NO ONE CAN PREDICT THE FUTURE. ONLY GOD KNOWS WHAT IT HAS FOR US. Elder brother kwa? Compared to the things the guy did, I'd say they did nothing to him. Truly if men were to be God and our destiny lies with them the world will be a jungle. But thank God it is not so! This kind of story happens in our lives, though in various forms, but thanks to this igbo adage ''aka ekpuchi onwa'' (the hand can never cover the moon). What God has planned for you must surely come to pass. No one is really God. Actually, God gave everybody chance to do whatever one likes, but Heaven is the reward of good work. Please don't live your life like Ugochukwu if you are heavenly-minded. Never look down on anyone because you can never tell what tomorrow has in stock for that person. Show love to all human beings even when the love is not reciprocated. Nice one, ma! never look down on or under estimate anyone ..... indeed no one is God ...aunty, another touching story. Avoid jealousy, avoid envy, avoid violence, avoid greed, avoid selfishness because they are all fruits of the flesh. No one is God indeed,this story is really interesting. some people are just like the man in the story, that is, mazi udoka. Most times, you may overlook such behavior but when it reaches the extent of that unkind man, then it can be termed as wickedness. I don't recall any character called Udoka in the story. Bless you! The world is full of evil and wickedness ,how can someone be so heartless and wicked to his own blood? he only care about his own good and his personal family which is very bad of him.but finally God made a way where there is no way and show him that mmadu aburo chukwu(no one is God).And we should trust no man. BE BLESS MA. In the words of my matron "Affluence without generosity stinks". This Statement is really true in the case of the characters in this tale. The artful graphics also depicts the theme of the story. A little gift which may mean nothing to us can mean everything to another. This story teaches us generosity. In this life, what goes around comes around. You never can tell who will be your saving grace tomorrow. Therefore, we should always be good to those around us. Charity, they say, begins from home. Indeed, no one is God. Whatever God has destined for someone must surely come to pass. It only takes but a while. If you refuse to be used by God to impart lives, just like Ugochukwu did, God will surely appoint someone else to take your place. No matter what, his word must surely come to pass. Great title for a great story! It is still very hard for me to believe that people could be very heartless and wicked just like Ugochukwu.... hope more women can stand up just like Chiwetalu in this story. Enough is enough, people ought to stand up and quit allowing others to ride them and look down on them.... Thank God no man is God...... Great story Ma. Obiora is really a strong and good man, no matter what Ugochukwu did, he never changed, he was still that generous man. Well No one is God and no one can ever be God, he does his mighty works at the appointed time, he put our enemies to shame in an astonished manner.. Women will always be women as in the case of chiwetalu, although she was patience enough but she bursted out at due time. I really enjoyed the story ma, my laughter could be heard at Ogige market. This story teaches us many things, i wish some people will understand that there is nothing in this life, generosity is a natural gift from God. In this life don’t feel you a too special because you are wealthy because it is someone that is watching over those wealth for your which is God. Ugochukwu took obiora’s generosity and calmness for granted, he wants everything good for himself alone which is not good in the eyes of God abd man May God bless us with wealth and give us a generous heart to help people around us. AMEN. Truly, No one is God. He shows mercy to whoever He want to: the wicked, rich, poor. No one knows tomorrow and what it holds for us. Never knew good, generous and kind people like Obiora really exist as portrayed in the story. Ugochukwu depicts and defines rich individuals in our society that are unkind and looks down on people not knowing what tomorrow holds for us. Nice story ma. At first, i thought Chiwetalu and her daughter Chidera were the bad guys, for being unfair to Ugochukwu, but as the plot unfolded, i discovered it was actually Ugochukwu, but as the plot unfolded, i discovered it was actually Ugochukwu that is unfair. What be got at the end serves him right. It is important to give a helping hand to the needy if you are in the position to do so, as no one knows tomorrow. No one is God and no one can ever be. God is ever merciful and compassionate. He shows mercy to whoever he wants to. Ugochukwu got what he deserved. onyeka was determined and wanted to achieve his goals no matter the challenges he faced. It is what I call a twist of fate. We all should always be good and kind. It really obvious that there is God, he is immutable, indubitable and he also shows mercy to any he wishes to. Finally, no contingent being can be like God. I like Chinwetalu's behavior after she discovered that all Ugochukwu knows how to do is to see that they have nothing good at all even when he can provide it. The news of Onyeka's success surprised him because he thought that he is the only one that can help the family, it serves him right. Actually, no one is God. I love the way the story was written, it is at the end of the story that you will realize what brought about the expressions in the beginning of the story. truly, Ugochukwu is not living up to expectation to Obiora's family and needs to be stopped. I love the attitude of Chinwetalu and chidera towards him when he wanted to collect the painting. an inspiring story! There is no difference in the happening around and what the story is tryin to say..this particularly happens in most of the families when a particular relative tries to gain from his relations buh does not assist them...well this story is tryin to convey a message that no mattet wat we should assist and love oursef.. In life,God is the only one who could elevate someone.He picks someone of little or low background,status and catapult that person into a personality.We should use our wealth to help the needy.Helping the less privileged shows strength,compassion and just like God gave us freely we should do same.The first can be reduce to the last and vice versa. This idea of both prominent men and women taking what does not belong to them in a cunning way is very bad. Ugochukuwu has taken more than he has brought to Obiora's family. Thank God for Chiwetalu who discovered early, therefore, breaching Ugochukuwu's unending greed. Hmm. What a story. "Whatever you sow, you shall reap". Indeed there is none like God. He rewards all according to their works. The heart of men is wicked, how could ugochukwu be that ungrateful. God is a wonderful God, he will see the effects of his actions when the time comes. Am ashamed of people like this.unfortunately I have an uncle just like ugochukwu.He has reaped the fruit of his actions. It is a pity that some people who have more are still the ones that are never satisfied. They'll still want to exploit those with very little. It is equally Ironical that those who have very little are still the ones willing to give more. Generosity is not in how much you have. But in the heart. The beauty of having is giving. If you cannot give, then your having is useless. The stone which the builders rejected has really become the chief corner stone. Humans are not God, the lord makes a way where there seems to be no way like he did for Obiora. Having resources without letting people tap from them doesn't make sense. Ugochukwu's habit of not giving and collecting from his brother the little he has is very bad, but Chinwetalu's attitude towards him especially using her daughter as an instrument is totally bad and unjustifiable, for even God does not expect us to repay evil with evil. What is the evil? They gave him food but they refused to let him pick the artwork decorating their living room. He could have asked for a similar painting to be done for him and PAID for it as a way to encourage the girl. But, no! He must collect it just like that, as though he's the only one who deserves good things. In my opinion, they taught him a long overdue lesson. Such a wonderful story, indeed no one is God. People should learn how to help those in need because nobody knows tomorrow .It is also necessary for one to love their fellow human beings just the way God loves us. wonderful piece,no one on earth is truly God.No entity knows what the future holds for them.it should always begin with Charity at home. Love always strives in a family.in the Igbo society, Africa thrives on communalism, the igbo society has always preached communal living.we should practise it. No one is God oo Also, no one ones tomorrow. That man has mind sef o. How can you come and visit somebody and not bring any thing? Upon he's the rich one sef. Honestly, he deserves the treatment he's getting. He's too greedy biko. He's just a collector. He never saw their son making it but God has disappointed him. Truly, no one is God! Great story ma Ugochukwu's character is most popular in contemporary igbo society. Chinwetalu is a strong woman, she knows when act. If we igbo's start helping our family members who knows when u fall someone will be there waiting to catch u . This story illuminate things that happen in our society. People don't value your being good, you help them and when they become a success they forget you. Thank God for putting smile on Obioras face through his son Onyeka. No one is indeed God.